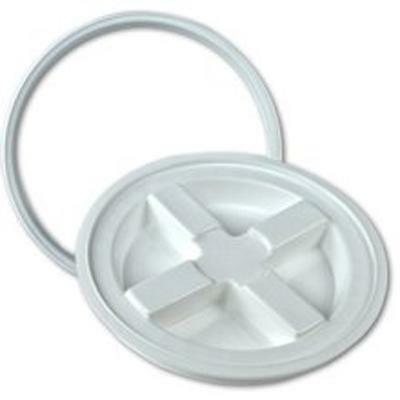 The patented Gamma2 Seal Lid uses two gaskets to assure an air-tight and leak-proof seal. Made in the USA from high-quality, durable plastic. Features Gamm2's signature lid for easy opening and closing. Ideal for 3½ - 7 gallon, 12-inch diameter pails and buckets. Like many households, you probably have a 5-gallon bucket or two hanging around just taking up space. Thanks to Gamma2 Plastics, you can now turn that useless bucket into an air-tight and leak-free storage container! The Gamma Seal Lid is a unique, high-quality item, that is made in the USA. Gamma2 has created a special seal and adapter that is first attached to the rim of the bucket. Then the signature Gamma2 spin-lock sealed lid simply screws down into the adapter and voila! You now have an excellent air-tight container that can be used to store food, pet food, paint or anything else that needs to be kept air-tight, dark, and/or moisture-free.